The vessel Yarmouth Belle was built as a passenger steamer in 1892 by Thomas Bradley of Southtown, Great Yarmouth, for his own use. It was sold to the Great Yarmouth & Gorleston Steamboat Co. five years later, and was then used mainly on the Yarmouth to Norwich service on the River Yare. In the twentieth century she was re-plated (1931), and sold to Henry Hastings of Kingston-upon-Thames (1945), two years later being fitted with a 1933 diesel engine — her funnel and wheel are both just decorative now. 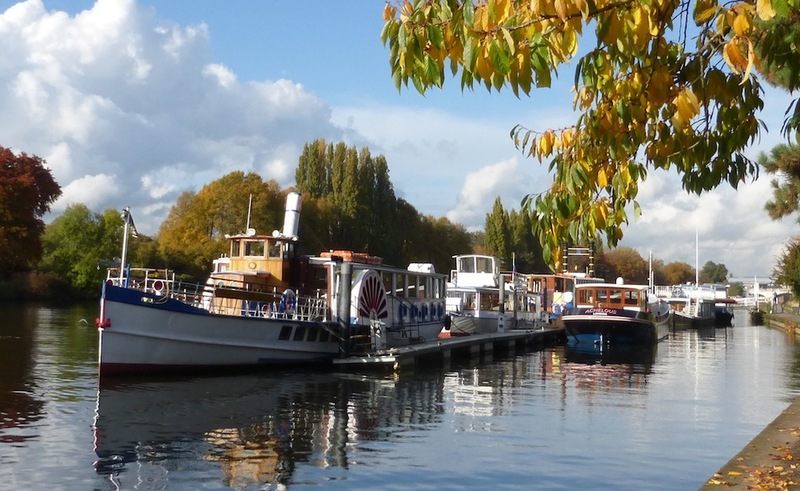 Today, the Yarmouth Belle belongs to Turk Launches, Ltd., at Kingston, "a 300 year old river boat company that cruises along one of the most scenic stretches of the Thames in South West London" ("Turks"). A rare survivor of a Victorian passenger boat of this kind, she is moored with other excursion boats not far from the city centre. In 2012 she had the honour of sailing in Queen Elizabeth II's Diamond Jubilee Pageant. Photographs, text and formatting by Jacquelien Banerjee. You may use these images without prior permission for any scholarly or educational purpose as long as you (1) credit the photographer and (2) link your document to this URL in a web document or cite the Victorian Web in a print one. "Yarmouth Belle." National Historic Ships UK. Web. 15 August 2017. Turks: A Thames Tradition Web. 15 August 2017.